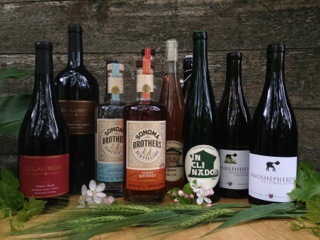 With the word artisan co-opted by everything from large supermarkets to national fast food companies, neighbors Colagrossi Wines, Sonoma Brothers Distilling, Tilted Shed Ciderworks, and Two Shepherds Wine have joined together to highlight the true meaning of “artisan.” As artisans, we each make high-quality beverages in small quantities by hand, using traditional methods. We make our small-lot beverages onsite, giving guests an unfettered look into how we make our distinctive wines, spirits, and ciders. To complete the fun, we will also host the Bariadelli food truck and AWS Prospero, supplier of home winemaking and home brewing products, in our parking lot. Entry is $20 a person in advance via Eventbrite (https://artisanalleylaunch.eventbrite.com, $25 at the door) and includes tastings at all four locations and a $15 purchase credit. About Artisan Alley: Formed in 2016, Artisan Alley (http://www.artisanalleywindsor.com) is a collection of the artisan producers Colagrossi Wines, Sonoma Brothers Distilling, Tilted Shed Ciderworks, and Two Shepherds Wine. We are located next door to each other on Bell Road in Windsor, CA (7755 to 7763 Bell Road).